Androsace are Alpine plants of great beauty, belonging to the Primrose order. Other families, like Primroses and Hairbells, come down to the hillpastures, the sea-rocks, or the sunny heaths, but these are more alpine than the Gentians, and as they are, among flowering plants, those most confined to the snowy peaks, so they are the dwarfest of this class. Androsaces are often high alpine plants, and it is only on the wellformed and cared-for rock gardens that one may grow more than a few kinds. Androsace must endure intense cold, which would destroy all shrub or tree life exposed to it. And here in spring they flower. Androsaces in cultivation enjoy small fissures between stones, firmly packed with pure sandy peat, or very sandy or gritty loam, not less than 15 inches deep. They should be so placed that no wet can gather or lie about them, and so planted in between stones that, once well rooted into the deep earth-all the better if mingled with pieces of broken sandstone-they never suffer from drought. It is easy to arrange rocks and soils so that, once the mass below is thoroughly moistened, ordinary drought has little effect. Most kinds thrive in full sun, the best aspects being south and west. A few kinds such as A. lanuginosa and sarmentosa do well in ordinary conditions of soil; but many of the dwarf kinds rarely thrive except in northern or hilly districts. When out of flower, it is easy to forget such tiny plants, so that they may suffer neglect while making the summer growth. A constant watch is needed for aphis, slugs, and red spider mites. Towards autumn syringing them with clear water does good, and a surface dressing of soil and stone-chips helps before winter, and should be renewed in spring, if need be, when all planting should also be done. When this top dressing is well done, fresh roots are often made from the underside of the prostrate stems, and this is a great gain. The woolly-haired kinds, which often fail from damp in our winters, should be planted in the crevices of upright rocks, or under ledges. The rocks among which they are planted should be well sunk in the ground with thin layers of good soil and broken stone between them; the roots delight in the layer of moist earth just under stones. They may be divided into two groups; one including such easily grown kinds as A. lanuginosa, and a second group forming stemless tufts, and found only in rocky clefts. Over forty species are known, and others may be found when the mountains of India, Thibet, and China are fully explored. About twenty kinds are found in the Alps, some extending eastward by way of Austria, or southward to the Pyrenees, where four others occur peculiar to that country. A large group belongs to the Himalayas, and reaches thence to China. The following list gives the best kinds in cultivation and of value for the rock garden. Androsace Albana - One of the mossy kinds, forming small rosettes of deeply-toothed oval leaves and dense heads of pale pink flowers from April to July. Androsace Alpina - A gem for the rock garden, not easily grown. Its tiny tongue-shaped leaves are in crowded rosettes, forming cushions of 2 or 3 inches high, covered in June with flowers-one from each rosette-rosy-purple with a yellow centre. It needs peat soil, moisture at the root, and a rather shady spot. Syn. A. ciliata. Androsace Brigantiaca - A pretty plant thriving only in sandy or granite soils and upon slopes shaded from strong sun. It comes very near A. carnea, but with leaves of deeper green, and pure white flowers. Androsace Carnea - One of the best kinds, early in flower, free, and easily grown in light soils without lime. It does not form rosettes, but little spreading shoots covered with narrow-pointed leaves of grey-green, and heads of rosy or pink flowers with a yellow eye. Water freely in dry weather, and shelter from the sun in summer. Alps and Pyrenees. Seeds sown as soon as ripe. Androsace Carnea var. Eximia - A form of the last, hardier, more robust, and with larger flowers. It grows quickly into tufts 3 inches high, and if given dressings of light, gritty soil the prostrate shoots send roots from the underside. Androsace Charpentieri - One of the best, free in flower, and of strong growth in sandy soils. Rosettes of tiny, downy leaves in crowded masses, and rich rosy flowers hardly rising above the leaves in June and July, after other kinds have done flowering. Thrives best in crevices of sandstone or granite rock, facing south-west. Seed. Alps. Androsace Ciliata - A scarce plant from the Pyrenees, growing in small, dense columns of deep green leaves fringed along the edges, and crowned in April and May by large stemless flowers of bright rose. Granite soils. Androsace Cylindrica - Though classed as a species, this little plant is very like the last, and comes from the same region. It forms mossy tufts of rounded cone-like columns less than an inch high, covered thickly with hairs, with white flowers nestling in the centre during April and May. Pyrenees. Androsace Foliosa - One of the Himalayan kinds, beautiful and of free growth when well established. The leaves are not crowded into rosettes, but are large upon erect or trailing stems, grey with pale hairs, and turning reddish-purple in the autumn. The rosy-red flowers come upon long stems from June to September, and are large and in clusters sometimes of fifty flowers, lasting for a long time in beauty. It thrives in limestone soil, made light with leaf mould and grit, and mixed with plenty of broken fragments; in full sun, with moisture to the root in summer. Androsace Glacialis - In its wild state one of the most beautiful, growing in loose, flat tufts of branching stems clothed in downy leaves, and covered during early spring with flowers of pink paling to white. Thrives in clefts of sandstone rock, in full sun. Seeds. Alpine summits (always granite) at 6000 to 9000 feet. Androsace Helvetica - A charming plant of the mossy section, growing in neat rounded cushions of grey-green, hairy leaves set in rosettes, and lovely white flowers with a yellow eye. The flowers are so large as often to overlap. Thrives in gritty soil and partial shade, planted between limestone rocks closely set and deeply buried to secure moisture and drainage at the same time. Seeds. Alps and Carpathians. 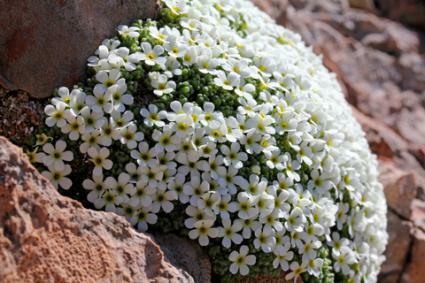 Androsace Hookeriana - A little-known kind from the Himalayas, at a height of 15,000 feet. Though hardy, it is apt to damp off in our winters, and should be planted in a mixture of peat and sand among rocks sheltered from wet. It has rosettes of oval, shining green leaves, and in spring deep pink flowers in small clusters. Androsace Imbricata - Pretty in leaf and flower, coming very near A. helvetica, but of denser growth, leaves narrower and silvery white with fine hairs, and white flowers set off by a bright rosy eye. Thrives in granite or sandstone grit in full sun. Seeds. Androsace Lactea - A free, strong-growing plant, making rosettes of shining green leaves, and in spring large white flowers with a yellow centre, in broad loose clusters of five or six. Easily grown in light limestone soil, in sun or partial shade. Seeds. Limestone rocks from 3000 to 4500 feet, from the Cevennes through the Alps into Austria. Androsace Laggeri - With clusters of narrow-pointed leaves, and flowers of bright pink paling towards the centre, gathered into showy little heads of six or eight. 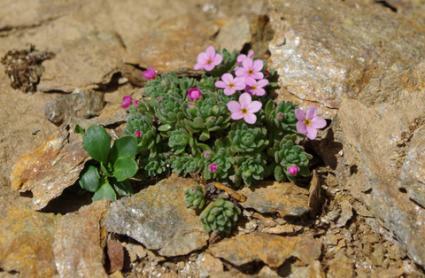 Very hardy, it is one of the earliest alpine flowers to open, starring the green tufts like a miniature Thrift. Sandy soil in partial shade, and no lime. Seeds or cuttings. Pyrenees. Androsace Lanuginosa - A lovely and distinct plant with trailing silvery shoots, leaves covered with silky hairs, and flower clusters of soft rose color. It does best in warm places near the sea, planted in sunny corners of the rock garden. Where the soil is free and open, it thrives as a border plant. It has a long season of flower, even lasting into October, growing best in south and west aspects, in sandy loam with a generous addition of mortar rubble. Cuttings 2 inches long of the unflowered shoots root readily in sandy soil in July and August. Seed (which ripens only in good years), layers, and cuttings. A good form of this is Leichtlini, with larger flowers of deeper color with a conspicuous eye. From 7000 to 10,000 feet. Himalayas. Androsace Obtusifolia - Robust and easily grown, with large rosettes of spoon-shaped leaves fringed by fine hairs, and short downy stems carrying from one to six white or rosy flowers with a yellow eye. It is nearly 6 inches high, and may be gathered by the handful upon the alpine slopes at midsummer. With us it flowers earlier, planted in peaty soil and in full sun. Alps and Carpathians. Androsace pubescens - A mossy kind with leaves turning red-brown in autumn. It may be known by a small swelling on the very short flower-stem, just below the flower. These are white, rather large, with a faint yellow eye, and come singly just above the little cushion of hoary leaves covered with star-like hairs. Of easy culture in crevices of sandy soil. Alps. Androsace Pyrenaica - One of the same mossy group, with tiny grey rosettes in dense tufts, one flower from every centre, white like helvetica but less pure, not so well formed, and upon short stems. It is not easy to grow well, but does best in deep fissures between upright rocks; it may also be grown on the flat, in peat and sandy loam between buried stones. Central Pyrenees. Androsace Sarmentosa - Leaves silvery with hairs, in dense rosettes, from which spring a few larger spoon-shaped leaves around the base of the flower-stem, and slender runners which spread and root in all directions. This kind spreads fast, when kept from damping by a layer of fine stones under the shoots and a glass shade in winter. It thrives in free limestone soil, firmly wedged between masses of rock in a sunny spot. The runners are easily layered and detached when rooted. Androsace Sempervivoides - A rare plant, pretty, easily grown, spreading by runners, and bearing clusters of pink or purplish flowers upon a stout stem in May and June. Its tiny leaves curl in dense conelike rosettes, at times only half an inch across, but often larger in gardens; the new shoots only take this curled form as they mature. This is one of the best of the Indian kinds, quite hardy, and growing well upon mounds of granite soil packed with stones. Kashmir and W. Thibet, at 11,000 feet. Androsace Villosa - A plant of wide range, from the Alps and Pyrenees eastward to Kashmir and the Himalayas, where it grows at elevations of 12,000 to 17,000 feet. The Western form is dwarf, with neat rosettes of shaggy leaves so thickly set with white or pale pink flowers that for the time the plant lies hidden. The Indian variety is of larger growth and blooms later, its leaves silvery with long, white hairs, and loose heads of flowers with a raised ring of darker color at the centre. Plant firmly in good, free soil, with lime rubble and sandstone fragments to keep it well drained. The downy leaves need shields of glass in winter. Seed. Androsace Villosa var. Chamejasme - A beautiful alpine plant known as the Rock Jasmine, inhabiting a vast range through Europe, Asia, and the Arctic regions. Though like villosa in flower it differs from it in leaf and habit, with a branching root-stock, spreading clusters of fringed leaves, and stout flower stems several inches high, bearing three to six flowers. These change from white to yellow, pink, and crimson, opening from May to June, and borne in long succession. It is one of the best and easiest of rock plants to grow in open soil, mixed and surfaced with broken lime rubbish or slate dust, thriving in full sun. Syn., Douglasia (Androsace Vitaliana) - Like a tiny Furze bush, hardly an inch high, with silvery leaves dusted over with white powder, and many flowers borne singly. Disliking dry or heavy soils, it does best in full sun, set in buried stones and free sandy loam mixed with pebbles and heath soil. Runners and seeds. Alps, Pyrenees and Sierras of Spain. 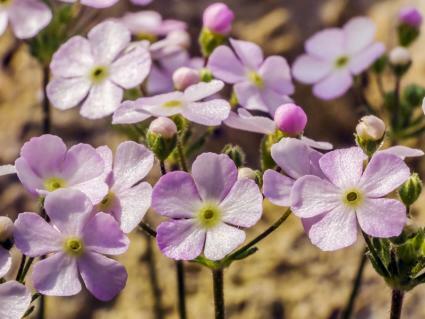 Androsace might be just the plant you're looking for to add beauty and interest to your rock garden. Follow the planting tips above, and you can enjoy this alpine plant for years to come.